Varna has long been touted as one of those places where development is likely to happen. The hamlet, which has under 1,000 people, sits close to Cornell in the town of Dryden – land is cheaper than most parts of the city, but the area is served by the bus line, which opens it up to Cornell’s deep-pocketed student market. However, Varna can be a tough nut to crack – this far out, the demand is mostly driven by more cost-conscious grad students rather than free-spending undergrads, and the going price for a rental is lower. With a less captive market and less lucrative rents, Varna becomes a trickier prospect. Plus, although the town itself is fairly accommodating, some members of the local neighborhood group, the Varna Community Association, have a disposition against rentals, preferring that any development that comes along be owner-occupied. Owner-occupied is possible as Tiny Timbers hopes to demonstrate, but it is more difficult to finance since a developer can’t guarantee income the same way they could with rentals. Since the 1980s, one can find at least six projects proposed in Varna that never came to fruition – the latest and grandest being a massive 260-unit proposal by the Lucente family, which the town turned away from further consideration after concerns about quality of life, and significant pushback from members of the VCA. Concurrently, the town was looking at updating the hamlet’s zoning, and the issues with the Lucente plan helped formulate the new Varna comprehensive plan adopted in 2012, and revised zoning not long thereafter. The zoning identified areas for density and dvelopment (ideally, a walkable core), and preserving more rural lands beyond the main drag. 902 Dryden Road, first proposed in June 2015, was the first project to come along after those planning and zoning updates. It was somewhat unexpected by some residents, because a redevelopment of this property was not envisioned in the town’s 2012 plan (which shows that plans are guidelines, not prescriptions). Initially, it was a 15-unit, 42-bed proposal, rentals aimed towards grad students and Cornell staff. Two of the units, totaling six bedrooms, already exist. Modern Living Rentals, a partnership of local developers Charlie O’Connor and Todd Fox, purchased the property in June 2014 for $215,000. At the time, the units were going to be entirely solar-powered, aiming for net-zero energy (what is produced on-site is equal to or greater than what it consumed). At this point in time, Fox and O’Connor had done some duplexes and the 6-unit apartment building at 707 East Seneca in the city, but 902 was going to their first “large” project. But, they hadn’t counted on strong opposition, not just from neighbors but from Cornell Plantations (now Cornell Botanical Gardens), who had concerns about the floodplain at the rear of the parcel, where it borders Fall Creek. The town was hesitant to move forward with approval unless there were revisions. As time wore on and meetings were held with the town and VCA, the project was reduced in scale; the lot size used to determine maximum unit density was calculated incorrectly the first time and two units were removed, and then the project was scaled back further to reduce impacts on the floodplain, moving the gravel parking lot so that it wouldn’t infringe on the plain – the final count came out to 10 units and 32 bedrooms, or 8 units and 26 bedrooms if counting just the new structures. The solar panels had been on the flood plain as well, but were eliminated because they were no longer financially doable at 8 units; it was stated that the infrastructure would be built to support net-zero energy down the line, if power was purchased from off-site. The reduced-size project was acceptable to the town and to Cornell, and 902 Dryden was approved in March 2016. Along with the existing duplex, two new units will be built opposite a shared wall. Two three-unit clusters will also be built on the east side of the parcel. The middle units of the three-unit clusters will have four bedrooms with 1606 SF of living space; all the rest will be three-bedroom units, and about 1500 SF each. STREAM Collaborative is the project architect. There are two separate groups of drawings floating around for the buildings, and I am not sure which is correct. The render below, from shortly after approval, shows warm colors. Renders on MLR’s website show what looks like blue, brown and white fiber cement panels. The unit rents range from $1500-$2000/month for the three-bedrooms, and $2600/month for the four-bedrooms. The project cost was estimated at about $1.5 million in early Site Plan Review docs. It’s a bit of tricky site for photos- the site borders the intersection of 366 and Forest Home Drive, leaving a pull-off in front of the mobile home park, or at the spit of land where the roads split. But it looks like site clearing and foundation excavation are ongoing. If anyone knows who the contractor is, drop me a line in the comments. 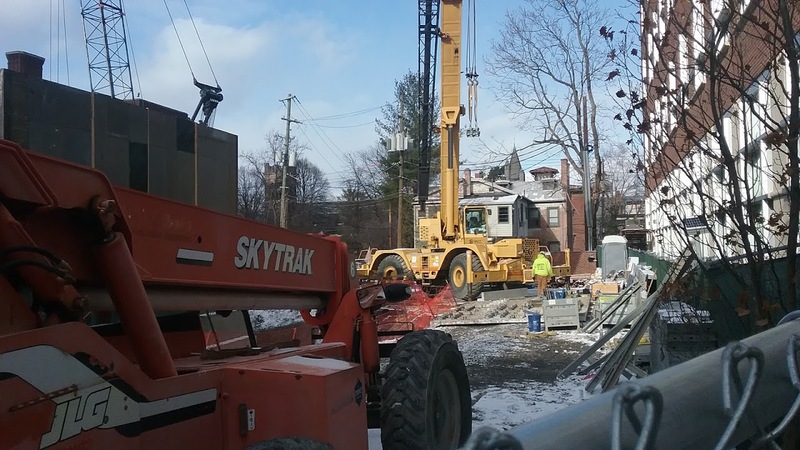 The Collegetown construction boom continues. In 2017, the city can expect at least five projects to open in the neighborhood, with a net gain of about 118 beds and $16 million in assessed tax value** – a two-family house at 123 Eddy Street; Cornell’s, 6-story, 76,000 SF Breazzano Center for its Executive MBA Program; the 5-unit, 28-bed 126 College Avenue; the 9-unit, 36-bed 210 Linden Avenue; and lastly, the 5-story, 74 bed 201 College Avenue. Which has also been by far the most contentious one. The project was first proposed in March – and from beginning to end, the only substantial change was a mild revision to its upper floors to create a setback as a modern deference to the Grandview House further up the block. That resulted in a loss of two bedrooms, dropping the plan from 76 to 74 beds. For Todd Fox, who proposed the building through his company Visum Development Group, there wasn’t much room for revisions. He was going to, and paid, a premium on the property – $2.65 million, formally deeded in June by its previous owner, a small-scale local landlord who owned it for about seven years prior. The site held an early 1900s apartment house with three large spruce trees at the front, which became another source of contention during the debate. To make the project financially feasible, he needed to build to the maximum 5 floors and 70 feet allowed by the site’s MU-1 zoning (the project would have been outright impossible before the 2014 CAFD zoning overhaul, due to the parking requirement), and building micro-units with mezzanines would make the project pencil out – the profit value of the vertical space was effectively maximized. Working with architect Noah Demarest of STREAM Collaborative, he proposed a fairly modern building with fiber-cement panels, woven bamboo boards and cedar accents. However, one thing that did not factor in to the calculations was the neighbor of 201, 203 College’s Neil Golder. Neil is a 44-year resident of Collegetown, having moved in in 1972, and buying his house in the early 1990s. As the kitchen manager for Loaves and Fishes and a former Common Councilor for the 4th Ward, he’s well known among the Ithaca community and is well connected to its grassroots organizations, as well as the political movers and shakers. By any account, Neil and his late partner Kathy Yoselson are beloved stalwarts of Ithaca’s progressive scene. However, Neil has generally not been a fan of development, particularly Collegetown’s (with one notable exception – 307 College). What 201’s debate boils down to is a clash of two strong personalities. Todd Fox, who is probably the most gung-ho and financially adept developer one will find in the city of gorges; and Neil Golder, who was determined as hell to stop the project planned for the house next door, which wasn’t just a development, it was a project that he deeply felt would be a major detriment to his quality of life. Hence, Neil launched the group “Save the Soul of Collegetown“, under the auspices of protecting all of Collegetown, but mostly as a personal vehicle to drum up support to battle Fox and his apartment building. The point of this summary isn’t to summarize every detail. You can read the 580+ page summary from the city, or all the Voice articles here. But there are a few key plot points. After review and a negative declaration of environmental significance (meaning, effectively mitigated), he project received preliminary approval in June, and the city and the planning board were promptly slapped with a lawsuit by Golder. The stated case was that the environmental assessment was inadequate and that the project needed an EIS. Although it was quite a stretch given past precedent, it did make the planning board quite uncomfortable. John Schroeder, a longtime board member who served with Neil on the council, did a very deep analysis of the 2014 zoning code and determined that the building may be illegal on technicality. That technicality was about building facade length, and whether Bool Street was a primary facade – if it was, it would legally have been required to be two separate buildings for having too long of a continuous face to the street. The zoning code, however, illustrated that an approach with indents such as 201’s were acceptable, and the city planning department, in their pre-site plan review assessment and meetings with Fox, had signed off on the plan as legal and acceptable. And they maintained that it was acceptable. So there ended up being a battle between the planning board, which is appointed though knowledgeable community members, and the planning department, which consists of vetted city staff. These kinds of battles are extremely rare, and it is likely that 201 was the first in decades. While this debate raged, the building far exceeded its intended start date of July 2016. As a result, the site went on the market, and the plans were cast into jeopardy. Although Fox and his team wanted to avoid a trip to the Board of Zoning Appeals, it was determined by the board to be the only legitimate course of action. The BZA had to decide whether or not the project was legal. And, in a 3-1 decision in October, they decided it was legal, due to ambiguity in the code, and a lack of timeliness on the part of the planning board, as the legality was not considered until after months of review, after preliminary approval was granted. After the BZA ruling, work on the building began the next day. No one walked away from this one looking good; One reader emailed in and compared it to a Clinton vs. Trump vote. The debate sent a chill down the development community, and created additional bitterness for some of the old-timers who felt Ithaca was selling out to developers and student interests. The planning department and board were also left with some resentment towards the other; now that the code has been clarified, one can hope further battles like this can be avoided. Anyway, the building itself. Here are the floorplans. The mechanical room, a trash room, interior bike storage, gym and storage space occupy the basement. Four three-bedroom and four four-bedoom units (28 beds), with about 1,000 SF each, occupy the first and second floors. The third and fourth floors have micro-units, 16 of which will be about 392 SF studios, 8 of which will be 670 SF with two bedrooms, give or take a few feet for each (32 beds). The top floor has nearly the same layout as three and fourth, with eight micro-units of about 392 SF and 2 two-bedrooms of about 670 SF. However, the westernmost two units are studios, which have balconies and are about 400 SF each. So, 14 beds on the top floor, for a total of 74. The smaller units make use of mezzanine spaces and netting to increase usable space. Fox’s rental company, Modern Living Rentals, is handling the leases. The units are currently listed from $1,670/month to $4,170/month, depending on size and location. In the photos below, note that the excavated portion is only half of the building footprint – the basement only occupies the western half of the structure. The eastern half is slab-on-grade (Collegetown has more stable soils than most of the valley locations, so multi-story slab foundation buildings are feasible). The elevator core will be in the middle bridge of the “H”-shaped structure. Foundation forms are up and the concrete is being poured – through the fence, you can see one of the concrete footers already in place. William H. Lane Inc. of Binghamton, who just finished up the Marriott downtown, is the general contractor for the approximately $6 million project, which is paying a premium to meet the opening date of August 2017. **If you add in Phase III of Collegetown Terrace, which is on the fringe of what’s normally considered Collegetown, raise those numbers to 462 beds and $71 million. 1. For the developers out there, it looks like your next opportunity just opened up in Collegetown. For sale are three houses on Linden Avenue – 6-unit, 8-bedroom 230 Linden, for sale at $675,000 (taxed at $350,000), neighboring 4-unit, 8-bedroom 228 Linden at $700,000 (taxed at $460,000), and two doors down, 2-unit, 11-bedroom 224 Linden at $525,000 (taxed at $400,000). All three are somewhat run-down student apartment houses on the cusp of inner and outer Collegetown – as such, their zoning is CR-4, which allows four floors, 50% lot coverage, and has no parking requirement. The properties were all purchased in the mid-1970s by a small-time local landlord, who was killed in a car accident two years ago. According to the listings, the seller’s agent is a family member, and the units are leased until late 2017 or 2018, meaning that if one were to purchase with an eye towards rapid redevelopment, they would have to negotiate with the tenants, or wait it out. That being said, there’s a lot of potential here, particularly if a buyer combines 228 and 230 into one lot. The city designed the CR-4 zoning with Linden Avenue specifically in mind – the concept render is a northward perspective of a revitalized Linden Avenue. They’re a lot of money, but there could be some interesting news down the line. 2. Also in Collegetown, here are a couple of concept color renders of 210 Linden Avenue (left) and 126 College Avenue, courtesy of Visum Development’s webpage (currently down, cached link here). I confess to be more of a warm colors person, but assuming these are fiber cement boards and wood trim (or fiber cement that looks like wood), they could turn out quite nice. On a related note, Visum’s Fox and partner Charlie O’Connor have started earth moving for their townhouse project at 902 Dryden Road in Varna. As it turns out, it is a very difficult site to get photos of, despite its easily accessible location. I’ll do a more in-depth shortly, but the units should be ready by August. 3. Fulfilling a promise to Fred, here’s the rather upscale McDonald’s/Fasttrak combo under construction North Road in the village. There is a billboard on 366 advertising for new hires for when they reopen, but unfortunately, it was too difficult to attempt a photo of the board and render. The building’s exterior is largely complete, and the gas station canopy is framed – late winter opening? The new construction has a price tag of about $500k. Honestly, for a roadside stop, it looks pretty nice. 4. More on Dryden, with a couple houses of the week. Looks like some modulars are going into the Maple Ridge development – one recently completed, one in the works. The open space to the right of house number two, the Cape Cod, will host a garage. The land for house one sold to Kenn-Schl Inc, a regional modular home builder and seller, in June for $48k. House two’s land was sold to a Rochester man for $39k in October. At this rate, Maple Ridge is going to fill out their 15-lot phase one in another year or two. Although waylaid by the Great Recession, the big plan is for three phases and 51 lots. 5. On the 15th, the construction loan for the William George Agency’s new 1-story, 24-unit dormitory was filed to the county records office. The $3 million loan comes courtesy of …. A trip to the property didn’t pan out, it didn’t look like anything was underway even though the building permits were filed with the town of Dryden a few months ago. Then again, as a facility for troubled youth, it’s not the most welcoming place for a random visitor to be taking photos. 6. So what’s being discussed by the towns? In the town of Ithaca next week, a lot line adjustment between two houses, and more Maplewood discussion, with consideration of preliminary site plan approval. Meanwhile, the town of Dryden has cell towers galore, as well as revised approvals for Storage Squad (1401 Dryden) and Tiny Timbers; plans are in the pipe line for a 7-lot subdivision of the Dryden Lake Golf Course, and a possible sewer extension study for NYS Route 366 east of the NYSEG building. 7. Speaking of sewer, the town and village of Lansing are negotiating sewer deals so that the town can use village lines to help accommodate future growth. Dan Veaner at the Lansing Star has the story. the report says the town is asking for 700 units of capacity, where a unit is 328 gallons. 700 units would also put the Cayuga Heights plant at capacity. The town’s intent is to extend sewer capacity to encourage development along Triphammer Road (as in the town center concept shown above), with the reasoning that it’s a natural extension of established development, and would help grow the tax base in the event of the power plant closing. Not as grand as the plans that were shot down in 2007, but like the Warren Road sewer built a few years ago, it’s seen as a more organic and cost-efficient approach. 8. There might be some of movement on Jason Fane’s Bank Tower $4 million renovation from office space to 32 apartments. The windows were inspected and tagged recently, possibly to determine what needs to be replaced where. Most of the exterior of the Commons-facing building will receive a cleaning and re-freshening, with the bulk of the work geared towards the interior. 9. In economic news, 24/7 Wall Street is reporting that Ithaca has the 25th best job growth in the nation from November 2015 – November 2016. 2,200 jobs equates to 4.4%, by their measure. Hate to burst the bubble, but don’t buy into it just yet. Initial estimates can be way off due to statistically insignificant sample size for small communities. It may hold, it may not. Wait until March and see if the numbers get revised. The Town Planning Board filed a Notice of Completion on November 30th, 2016, which can be viewed here: http://www.town.ithaca.ny.us/major-projects/maplewood. The Town Board will consider adoption of a Findings Statement on December 20, 2016. The city will specifically sign off on the bus stop and landscaped area at the northwest corner. STREAM Collaborative is the landscape architect. Tweaked since last time – a little more glass in the stairwell, and the roofline of the classroom building has been broken up with three distinct gables. This is what I get for writing things over the week rather than all at once. Confirmed fiber cement panels (wood-like and Allura olive green) and a very light yellow Nichiha panel. Charcoal grey fiber cement panels, light grey panels, natural wood trim and red doors. The base will be stucco. Steve Flash’s 21-unit apartment building for Inlet Island was approved two years ago, but has not moved forward due to soil issues and parking costs. This new version is still a housing proposal, but I’m hearing for-sale units that may be condo-like. The design will also be new, but the aesthetic will be similar – it will once again be crafted by STREAM Collaborative. I know about this project because a county staffer emailed me by accident. But without official docs, I wasn’t about to report on anything. The plan calls for a mixed-use building, not unlike that seen in design concepts a couple of years ago. TCAction and INHS are involved, so there is an affordable housing component – probably looking at mixed-use overall. • 3053, Sign Variance, 310 Taughannock Blvd. • 3055, Area Variance, 113 Farm St.
• 3056, Area Variance, 301 E State St.
A. Update — Chainworks DGEIS – Transportation Comments/Responses – yes, it’s still going. B. Update — City/Town Joint Planning Board Meeting Jan 31, 2017 – Maplewood? The Hotel Ithaca addition at 222 South Cayuga is topped off and has taken the shape of the final product. Most of the new windows have been fitted into the exterior walls. Air conditioning units will be installed in the smaller openings. Peering inside, it looks like the interior framing is all set, and utilities rough-ins are underway. In most places, the DensGlass fiberglass mat sheathing is being sealed up with R-Guard FastFlash liquid flashing, to close up the seams, joints and fasteners. Some of the newer sections, like the south wall, have yet to be sealed – in fact, workers were cutring and installing the DensGlass boards on the balconies while these photos were being taken. Since the balconies aren’t meant for full-time occupancy, the fiberglass mats are going directly onto the steel studs, without the R-Max polyiso. Taking a guess here, the gray coat on the front (east) wall might be a primer material for the exterior facade. Along with general contractor and frequent Hart Hotels partner Krog Corp, it looks like Henderson Johnson Inc. of Syracuse was tapped for some subcontracting, and IBEW-sponsored John Mills Electric of Ithaca is handling the electrical rough-ins for the new wing. The new $13.77 million addition should open in May 2017, just in time for the big graduation weekends. More background info on the Hotel Ithaca project can be found here.